Pop up stores are fast becoming a feature in Singapore, like in many great cities in the world (NYC duh). The 'limited time offer' concept confers exclusivity to the event, pulling in the crowd who doesn't want to miss out on something that could be great. 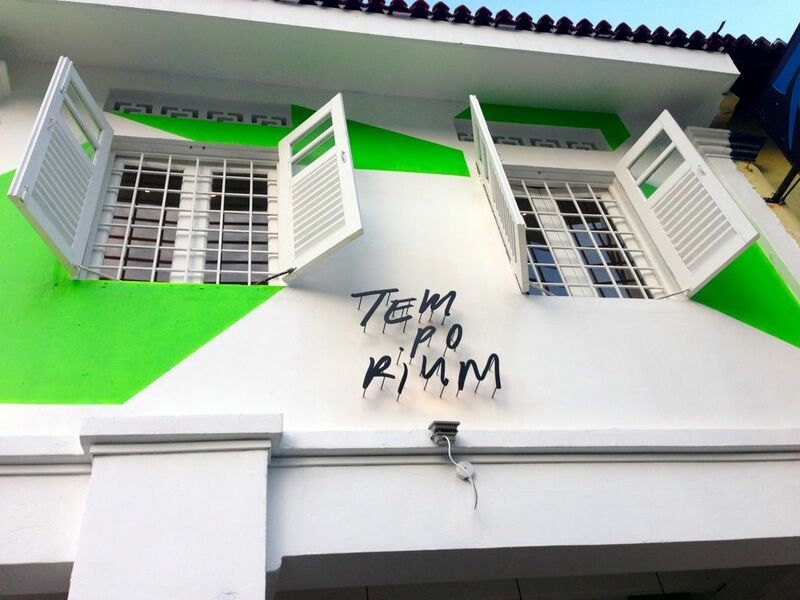 And Temporium is one great pop up that you shouldn't be missing out on. Located in the flavorful Little India district, Temporium houses a store, diner and gallery within two conservation houses on Dunlop Street. 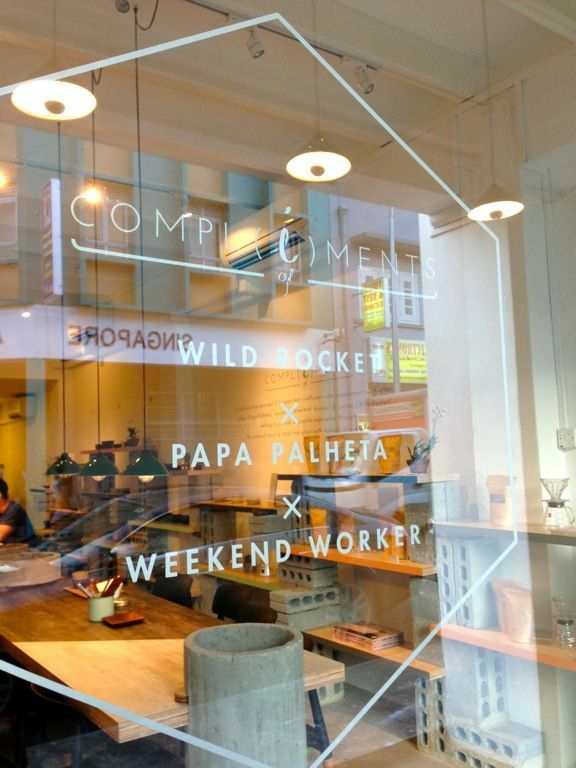 Unique pairings and cross collaborations of several homegrown brands, including Papa Palheta, Wild Rocket and BooksActually will be showcased at the spot till 8 Feb 2014. 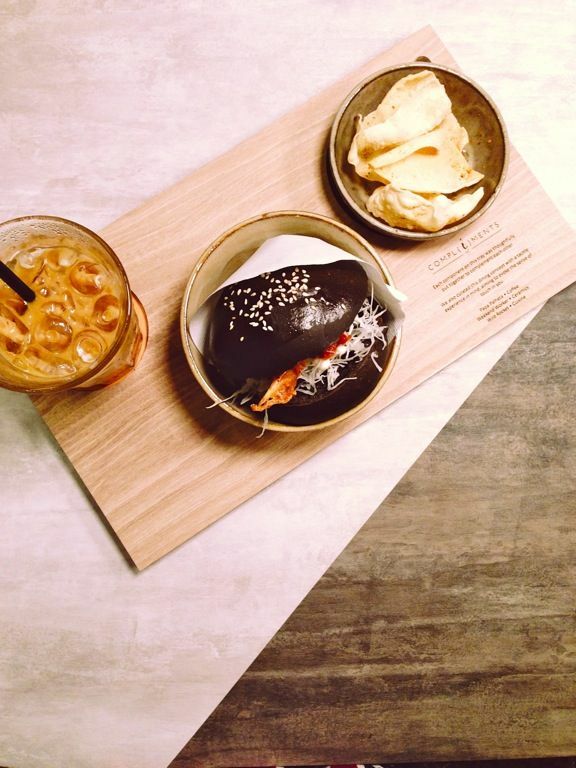 W and I visited the concept diner, Compl(e)ments Of, a 20-seater which sees the works of 3 Singaporean craftsmen who complement each other come together; Artisanal coffee by Papa Palheta, Ceremics by Weekend Worker, and cuisine by Wild Rocket. The main changes every month. Notice that it is singular, for there is only 1 option for lunch and dinner and another option for breakfast. We heard great things about Sep's Salmon red rice donburi with jicama salad which we missed as we just crossed into Oct. The main costs $16, though i'm not too sure if the price changes each month as well. But do go for the set, of course, because the items are supposed to complement each other. 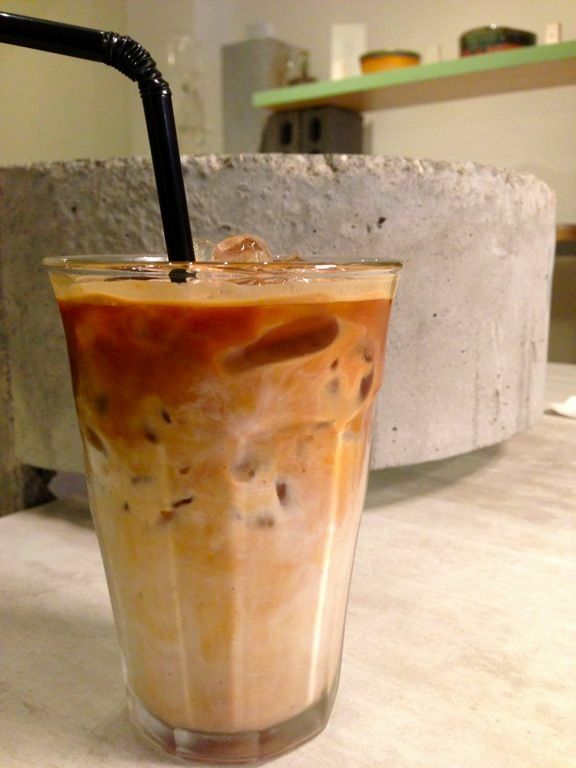 For $26, you'll get a coffee, the main and a dessert or cake. 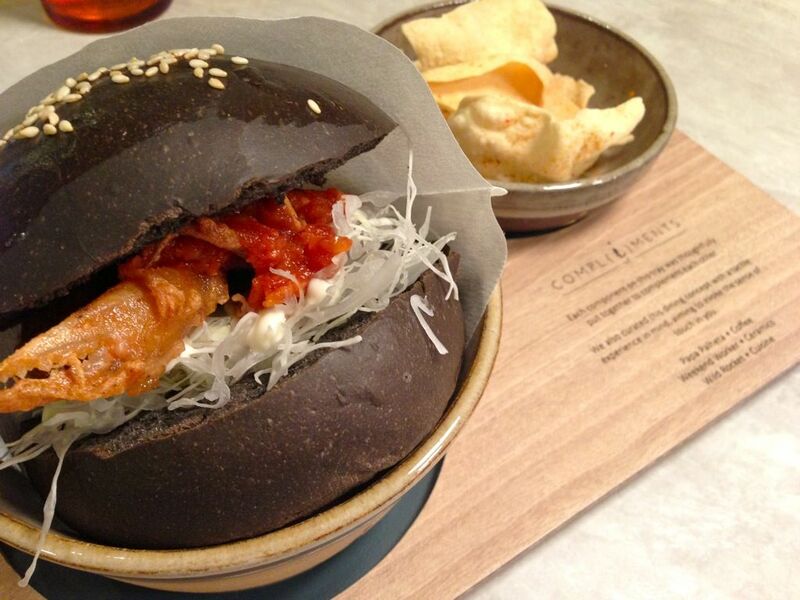 The October menu is a Chili Crab Burger, which is a tempura soft shell crab in chili crab sauce sandwiched in a charcoal squid ink sesame bun. The sambal chili packed a punch and had me downing ice water in an attempt to put out the flames. I would gladly go through hell to taste that piquant jam again. While the squid ink bun was lacking in the smoky flavor (I have yet to taste any that resembles squid ink), the pillowy bun had a light sweetness that complemented the fiery burn from the crunchy crustacean. And beware that chili kaffir papadums, i choked on the spiciness of the powder due to my carelessness. My my, i'm turning out to be the clumsy diner. We expected nothing less of Papa Palheta's coffee, after all it's the founding father of the third wave movement in Singapore. It had to be iced though due to the terribly humid weather that day. 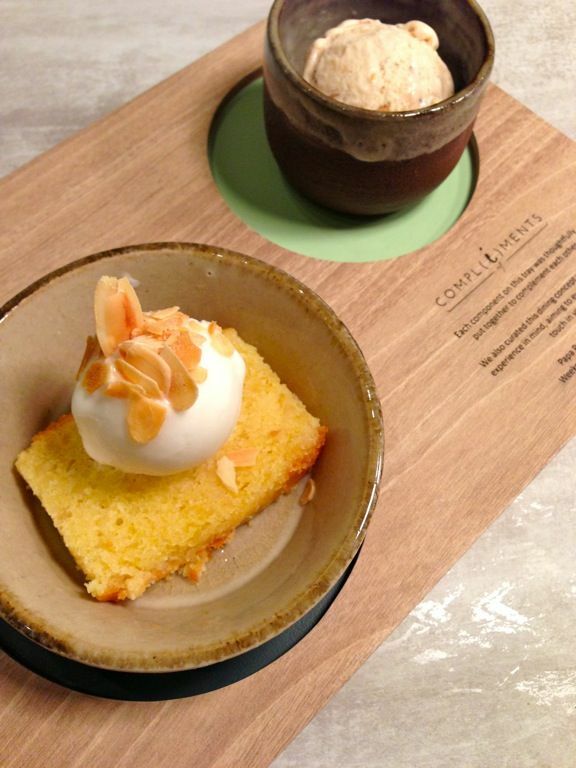 For desserts, we had the sugee cake with coconut ice cream and a double peanut fudge ice cream. Both scoops of ice cream were intensely flavored and delicious. The coconut ice cream reminded me of the awesome one that i had in Bangkok Chatuchak Market. It paired very well with the nutty and buttery sugee cake. Head on down quickly before you miss out on Oct. We heard a rumor that the Salmon donburi may be brought back by popular demand. Yay! Anyhow, with the changing menu, there's great reason to visit Compl(e)ments of every month.